Kurt Vonnegut has been on my reading list forever. I’m glad I can finally cross him off. I believe this is my first taste of science fiction and I can’t say I like it. Slaughterhouse Five is the story of a former American soldier who time travels to different moments in his life, and also to a planet called Tralfamadore. You know that the book is full of metaphors about life, free will, and war. The problem is the lessons or take-aways are incomprehensible. This book reminds me of two others. 1) Catch 22 because they’re both about war. 2) A Clockwork Orange because you feel like an outsider watching someone’s life play out and it’s confusing. With A Clockwork Orange, the language was difficult at first to understand, but after a while, you get used to the lingo. 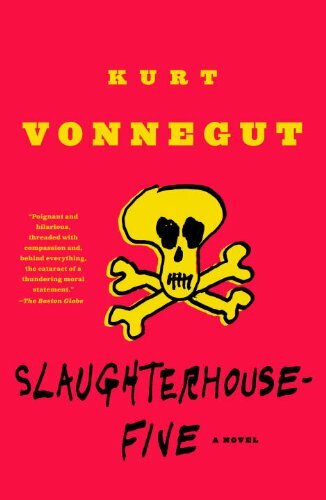 With Slaughterhouse Five, the plot and the characters were all over the map. I felt like I never got it. Moving on now to the book club books.